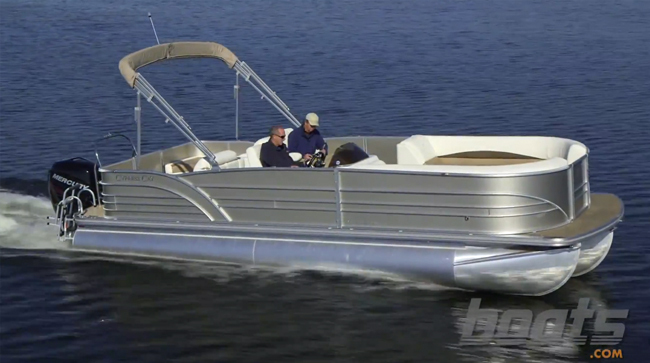 This top end pontoon boat checks off most of the wish list for reviewer Lenny Rudow. Did the manufacturer of your boat think things through, or did they always leave you wishing for something? On many boats the wish list just seemed to grow and grow. So let's find out how Cypress Cay did, with their Cayman LE 250, the top of the line from Cypress Cay. 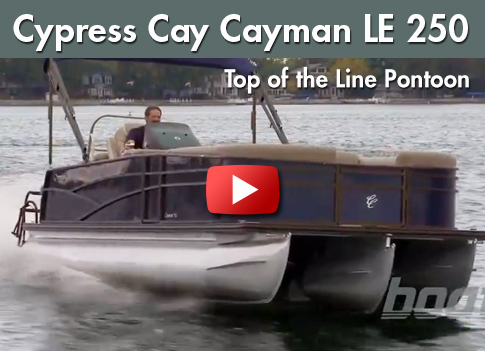 The Cypress Cay Cayman LE 250. Let's start with stowage compartments. 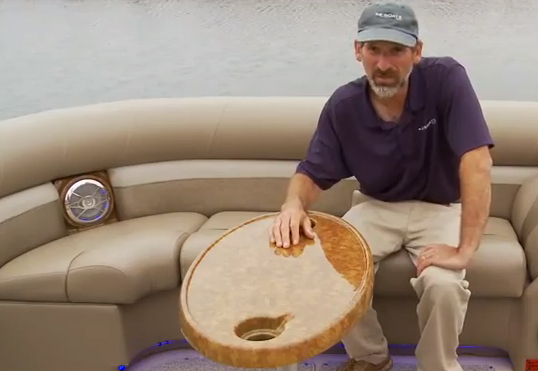 Now almost all boats like this have stowage under the seats, right? But when I take the cushion off, I always wish I had somewhere to stow it so it didn't bounce around and get in the way. Well, they've thought about that. 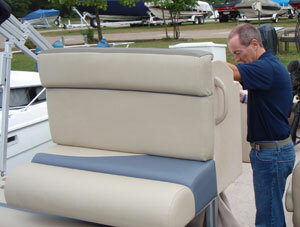 Now most pontoon boats have a table where you can sit down for drinks or lunch. But don't they often leave you wishing you had somewhere you could stow that table? Now just in case you were wishing you had a cooler, there's one of those too. Now I do wish there was a rack inside the console, so these items would be a little more secure down there. But that's really well thought out. Top end was a hair over 44 miles an hour. And when we ran this boat at 35 mph, we got 1.7 mpg. a result of dropping the center tube down about 3 inches. It allows you to really lean into the turns. LR: Now Jane, I noticed that this fabric is really smooth and supple. But when you use that type of vinyl, don't you risk sun damage? Jane: No all of our vinyl is UV protected and made for outdoor use. So it's going to hold up to the elements as well as any other material on the boat. LR: Styling is not something I usually pay that much attention to when I'm testing a boat, but I couldn't help but notice the color of this aluminum. Jane: One of the nice things about the Cayman series is you can add this Limited package. It makes the whole railing, rubrail, bimini, bronze anodized. So it really gives you a sharp looking boat out on the water. LR: Now Jane, I know Cypress Cay is a relatively new brand, but you knew enough to put this beautiful piece of aluminum attaching the pontoons to the deck. That's a really strong piece of metal. How did you know to do that? Jane: Well actually Cypress Cay's manufactured by a company that's been building pontoon boats for over 50 years. 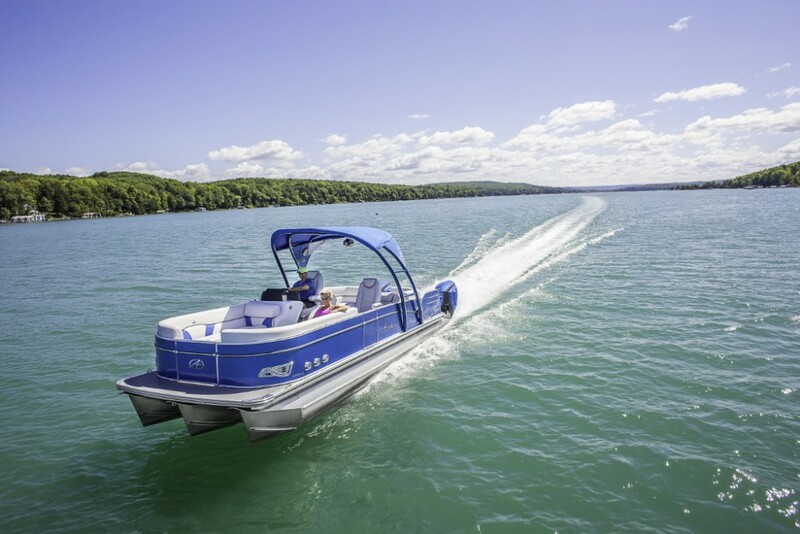 And one of the things we've learned is, if you want to keep your pontoon boat looking good ten years down the road, you need to reduce the amount of torsion that comes between the tube and the deck. And that's why we have the continuously running riser. LR: I noticed this seam. Does that mean the pontoon is actually built with two chambers? Jane: This pontoon has three sealed chambers. We keep the chambers away from that seam, so that we keep the structural integrity. 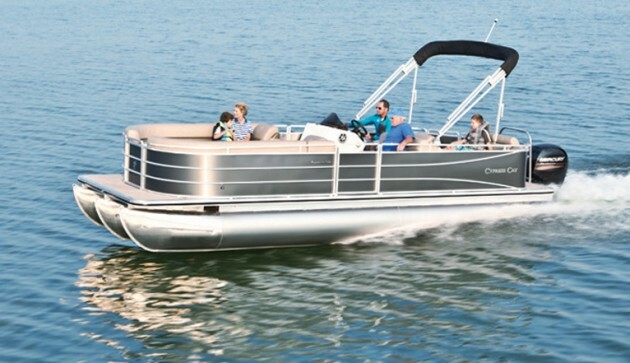 If you're going to spend a lot of money on a top of the line pontoon boat, you're probably going to put a lot of thought into it. And you should. 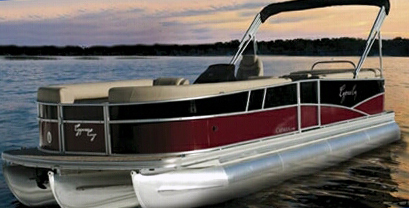 Just make sure that you choose a boat where the wish list has already been completed for you. A boat like the Cayman LE 250.